Q. 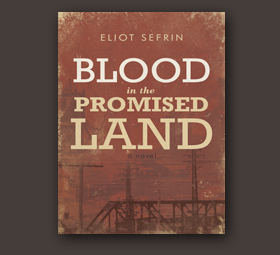 Blood in the Promised Land has been labeled as historical fiction. What do you see as its historical relevance? A. The novel offers what I hope is an insightful look at a turbulent and evolving America in the 1940s and the decades preceding, as seen through the eyes of the novel’s two main characters, Roosevelt Turner and Jacob Perlman. What the book attempts to do is to weave two disparate human stories into a single, cohesive tale that paints a portrait of a U.S. home front ravaged by a divisive, bloody, and often-overlooked racial conflict, and World War II as a pivotal turning point for blacks and Jews in America. Q. The novel’s plotline is tied to several important historical touch points. How would you describe them? A. The most obvious, of course, is that landmarks, events and historical figures connected to World War II, both in America and abroad, are referenced throughout the book, as is the racial tumult that characterized the home front throughout the war. In addition, Roosevelt’s and Jacob’s experiences—the journeys that led to their fateful meeting—are based on actual events that took place in America, Europe and the Caribbean. Roosevelt’s childhood, for example, is based on events that occurred in Rosewood, FL—an all-black town destroyed during a violent racial outbreak in the 1920s. His adolescence and young adulthood are based on circumstances that existed in Depression-era Gainesville, ground zero for Florida’s Ku Klux Klan. Similarly, his experiences in Mississippi and Alabama—and throughout his six-month odyssey north—mirror those of legions of rural blacks who fled the Jim Crow South to find defense jobs, and a better life, in industrial cities during World War II. Roosevelt’s effort to adjust to living and workplace conditions—and to a northern style of bigotry—in Pittsburgh also reflects the experience of tens of thousands of black migrants. His success in transforming himself from a poor transient with roots in sharecropping to a northern factory worker illustrates how blacks seized unprecedented wartime opportunities to remake the South, dismantle the worst of white supremacy, and attain permanent entry into blue-collar occupations. Jacob Perlman’s experiences in Vienna, and his attempts at escape, are also based on actual events during the Nazi occupation of Austria and the experiences of Jews after the takeover—including “Kristallnacht,” an infamous outbreak of anti-Semitic violence throughout the Reich. Jacob’s stay in the Dominican Republic, prior to emigrating to America, is based upon actual events that occurred in Sosúa, a remote hamlet on the Raphael Trujillo-led Caribbean island that served as an unlikely haven for Jews during World War II. His groundbreaking work in the field of cardiac medicine, as depicted in the novel, mirrored the efforts of wartime researchers who were making key strides in surgical procedures, pharmaceuticals and the treatment of major illnesses. Similarly, his work as a lector (or oral reader) in a Pittsburgh cigar factory mirrors what took place in urban sweatshops populated by thousands of Jewish refugee workers. Q. What other historical references are touched upon by the novel? A. Blood in the Promised Land is set across a wide expanse of geography, in locations I felt were especially significant to the era in which the story takes place. Aside from the Deep South, Europe, and the Dominican Republic, the novel’s primary action takes place in Pittsburgh, depicted as symbolic of the so called “Promised Land,” the northern industrial cities that served as major defense centers and flashpoints for racial conflict throughout World War II. The Jones & Laughlin Steel Corp., the steel mill at which Roosevelt works, was among the most prominent steel producers in America at the time. The Birmingham-based Tennessee Coal, Iron & Railroad Company, where Roosevelt finds work during his journey north, was also a major wartime steel supplier, and Birmingham, depicted as the focal point of black steelworkers’ efforts at unionizing, was a major stepping stone on migrants’ journey north. Lastly, the Pittsburgh neighborhoods in which Roosevelt and Jacob reside—the Lower Hill District and Squirrel Hill, respectively—were actual black and Jewish enclaves. The Lower Hill District, in particular, holds major historical significance, having once rivaled Harlem as the cultural capital of black America. Q. Real-life organizations and institutions were used in a similar fashion, weren’t they? A. Yes. For example, the Black Legion, the anti-black, anti-Semitic terrorist hate group portrayed in the novel, was a real-life offshoot of the Ku Klux Klan founded in Detroit and active for many years throughout the North; the reaction to such organizations by the FBI and similar law-enforcement agencies, as depicted in the book, reflects the realities of the era. Similarly, the Pittsburgh Courier, recruited by Jacob and Roosevelt as a source of support, was a major black newspaper that played a key role in both the civil rights movement and in informing southern migrants about life in the North. Q. How are the characters in Blood in the Promised Land symbolic of others like them? A. Both Roosevelt and Jacob experience a range of incidents and emotions that reflect the racial- and ethnically related realities faced by blacks and Jews prior to and during World War II. In that sense, they are symbols of entire groups of people. Conditions in the Deep South during the 1920s-’40s, including the Jim Crow laws, lynching, mob rule, and other forms of institutionalized racism that haunted blacks. How World War II was impacting employment opportunities throughout America, resulting in an historic “Great Migration” that changed the face of the entire continent and led to unprecedented opportunities to blacks. The pervasive dream of a northern utopia—or “Promised Land”—to which rural southern blacks could migrate in their quest for wartime defense jobs and a fuller, freer life. How southern blacks were recruited by northern job agents on the basis of promises about better jobs, living conditions, and civil liberties. How southern business interests, dependent for decades upon cheap black labor, conspired to keep blacks tethered to the South—often against their will. The endless debates among rural blacks over the merits of migrating north or remaining in the South. How decisions were made, and on what basis. The lonely, arduous journey North: How southern blacks traveled in their step-by-step odyssey; the jobs they took; the travel corridors they used; the means of transportation they employed; where they stayed; what they experienced. The vivid contrasts between life in the rural South and the urban North—and the sharp differences between migrants’ dreams and the realities; hardships that southern blacks faced in northern cities, and how they attempted to cope; living and working conditions for black steelworkers in Pittsburgh and similar cities. How wartime America was marked by racial conflicts, workplace tension, “hate strikes” and organized terror groups seeking to enforce traditional racial barriers. How blacks fought to win gains in the face of those obstacles. A glimpse at the growing U.S. Civil Rights movement, including efforts by black factory workers to fight for equal status, and the formation of a permanent black working class whose establishment led to later advances in voting rights, desegregation, a collapse of Jim Crow, and key social programs. Q. And what does Jacob’s story depict? How Vienna flourished as a center for history, culture, commerce, education, and the arts in the decades preceding World War II. How Jews played a major role among the city’s intellectual and cultural elite, serving as businessmen, industrialists, and professionals who were prominent in the arts, law, science, theology, civil service, and politics. How conditions deteriorated for Jews after the Anschluss (the annexation of Austria by the expanding German Reich); the discrimination, systematic loss of freedom, intimidation, degradation, incarceration, and violence that marked the pre-Holocaust era in Europe. The roots and causes of the anti-Semitism. How Jews attempted, largely in vain, to cope with the anti-Semitism through appeasement, political accommodation, and other age-old forms of survival and adaptation. How Nazi laws—including eugenics, the form of genetic engineering that was shaping public health policy—ultimately made life in the Reich impossible for Jews, who were faced with a choice of either flight from Nazi-occupied Europe or near-certain death. The political, emotional, and costly complications of Jewish emigration. The worldwide barriers to immigration, including many in America, prior to and during World War II. The desperate, last-ditch escape of the Perlmans to the Dominican Republic, one of the few nations willing to openly accept large numbers of Jewish refugees. Why the brutal dictator Raphael Trujillo opened his arms to Jewish settlers, and how the refugees struggled to survive as farmers amid isolated, primitive conditions in the Caribbean. The ways that Jewish immigrants adapted to life in America; the jobs they took; the neighborhoods in which they lived; the challenges they faced; how they felt about America and all they were forced to leave behind. Q. What message are you trying to convey in Blood in the Promised Land? A. I hope first and foremost that the book is seen as a powerful, evocative, and historically relevant novel that contains compelling insights into race relations in World War II-era America. In Blood in the Promised Land, I wanted to tell the stories of two men who are polar opposites in terms of race, religion, education, and roots … men who symbolize two of the most persecuted groups in history. More importantly, I wanted to convey how their lives, despite their vast differences, contained striking parallels tied to their race and ethnicity—commonalities that ultimately draw them together on a courageous, life-changing quest. I hope readers feel that the novel contains a powerful, and hopefully inspiring, message about the need for people to see beyond their differences, transcend the stereotypes that often define who they are, and form alliances that strive to achieve a common good. Q. What message are you trying to convey in The Death of Dahlgren Place? A. For one thing, I wanted to capture what it was like to live in Brooklyn during a simpler, more innocent time. The novel, set in the quiet, middle-class neighborhood of Bay Ridge, is based on events that took place in connection with the building of the Verrazano-Narrows Bridge and its approach road through a densely populated section of Brooklyn. The bridge, linking Brooklyn to Staten Island, in many ways symbolized a wrenching transformation taking place in New York and other U.S. cities during the years—from 1959 to 1964—that the novel spans. While I hope the novel has nostalgic appeal, however, I wanted it to go beyond a mere reminiscence, and chronicle the sweeping changes reshaping people’s lives at the time. I also wanted to make it a personal story. By telling it from the perspective of a young boy, I wanted to illustrate the impact the building of the bridge had on people’s lives: the anguish of forced relocation; the frustration of dealing with the city’s bureaucracy; the way residents were victimized by eminent domain; the range of emotions people felt; how passionately many of people fought against the project—and why. Q. Who is the novel primarily targeted at? A. Several million people were born and raised in Brooklyn during the borough’s halcyon, fabled postwar “Golden Years.” I’ve actually heard that something like one in seven Americans can trace their ancestry to people who once lived in Brooklyn. Many of those people look back at that time with vivid, fond memories. Because of that, Brooklyn memorabilia has become, in many ways, a cottage industry. There’s certainly a common consciousness among those who grew up there. I think they’d find the novel interesting—hopefully even moving. Q. The era that the protagonist, Nathan Wolf, grew up in—and ultimately lost—has been called Brooklyn’s “Golden Years.” Why? A. In many ways, the 1950s were the best of all times in Brooklyn, a unique time in the borough’s history. The sense of optimism that characterized much of America was pervasive. The world, for the most part, was at peace. The hardships wrought by two decades of economic misery had dissipated. People were working, fixing up their homes, buying cars, furniture, TV sets and consumer goods banned by years of rationing. The beaches and boardwalks at Coney Island swelled with raucous summertime crowds. The streets and playgrounds teemed with a new generation of children. The school system was the crown jewel of American public education. The Dodgers were winning pennants. The entire borough seemed alive and full of itself. It certainly seemed like there was a special magic to postwar Brooklyn—a period of hard work (certainly for our parents), but also one of simple innocent pleasures. People felt lucky to be living there. The world we resided in—the schoolyards, the playgrounds, our “block”—felt orderly, safe. There was a special connection between people, an intangible bond. So many people I meet with Brooklyn roots speak fondly, almost wistfully, of that time. There’s a sense of nostalgia. Part of it, I think, is a craving for childhood, a simpler, more innocent time. Maybe we were blinded to reality by childhood. Maybe we were incapable of, or just refused to see, the world for all its blemishes, the forces at work that would soon change our way of life. We were too busy being kids, having fun. Interestingly, while we were immersed in the innocence of childhood, Brooklyn was undergoing an immense transformation—one that somehow managed to escape our attention for awhile, but eventually became very evident to us and our families. Q. Brooklyn, in a sense, almost becomes a character in the story, does it not? A. In some ways, I think it’s every bit as much a character in the book as any single person. This book isn’t the first time that’s been tried, of course. Brooklyn has been featured for decades in books, movies, songs, and TV shows. Its major postwar icons—Coney Island, the Dodgers, the Brooklyn Bridge, the Navy Yard—are still known the world over. Its place in popular culture has been long established. In fact, I’d say that Brooklyn is one of those rare places that have achieved almost mythic status, existing as much as a state of mind as a destination. Not only is it probably the most well known place name in America, in some ways—certainly in the postwar years—it could be called America’s quintessential hometown; the biggest small town in the nation; cosmopolitan yet parochial; a patchwork of intimate, well-defined neighborhoods with distinct boundaries, yet tied together by a common identity and consciousness; certainly very different than any of the city’s other boroughs—most of all Manhattan. I tried to draw a portrait of Brooklyn in all its many dimensions: immense; dynamic; colorful; earthy; resilient; street-smart; cocky; the epitome of the melting pot that was—and still is—New York. I tried to show how it shaped our personalities and view of the world. Q. Was postwar Brooklyn really this mystical paradise that people talk about, reminisce about, almost pine for? A. Hardly. In truth, it was far from the innocent fairyland many people make it out to be. Sections were dirty and crumbling. Factories threw off blankets of sludge and smog. Some neighborhoods were breeding grounds for tension, discontent and crime. Ethnic factions humiliated, shunned and battled one another. The daily grind of work also took its toll. Life in Brooklyn’s factories, docks and other workplaces could be brutal and unforgiving. Accidents and illnesses were commonplace. Labor conflicts were common. Most people struggled simply to make ends meet. The times were far from perfect, too. The Cold War had many of us frightened of a nuclear attack. The civil rights struggle was bubbling to the surface. The stain of McCarthyism pervaded government, businesses, schools, the arts. Yet people still look at that time and place with great fondness. I think what they’re really pining for is their childhood, their lost youth, the innocence and relative simplicity of the time—everything they left behind. I know a lot of people who talk about Brooklyn all the time, who visit their own neighborhood periodically, reminisce. It’s almost as if they’re grieving for a lost home, searching to recapture a world that they know can never be so predictable, so safe, so orderly ever again. Q. How is the Verrazano-Narrows Bridge a symbol? A. It’s a symbol, I think, of many things. For people forced from Bay Ridge, it’s the physical embodiment of dislocation, disruption, upheaval, uncertainty, change. It’s also, sadly, a symbol of loss—the loss of homes; a beloved, close-knit neighborhood; a simpler, more innocent way of life. At the same time, it’s a symbol of progress; a city in the midst of sweeping transformation; an age of modernity unfolding in New York and across America. The bridge, at the same time, was being hailed as the most ambitious engineering creation in the past half-century, the achievements that were possible through science and technology. It was designed as the world’s longest suspended water crossing, the crown jewel of a public works program that had reshaped New York across half a century, a masterpiece of architecture whose construction, in many ways, reflected the spirit of postwar America—an optimistic, confident, dynamic nation flexing its muscles, exhibiting its ingenuity, spreading its wings. In that sense, it symbolizes the spirit of enterprise that led to the building of the Interstate Highway System and other great public works projects. To the novel’s protagonist, Nathan Wolf, of course, it’s symbolic of both an end to childhood and the beginning of the rest of his life—an engineering triumph that unexpectedly sets a new course for the young boy’s life. Q. Dahlgren Place itself is a symbol, too, is it not? A. Yes. If the bridge is a symbol of disruption, progress and wrenching change for the neighborhood, Dahlgren Place, in contrast, is a symbol of stability and tranquility, an entire way of life—simpler, more innocent, secure, insulated, idyllic even—that was being threatened with extinction. 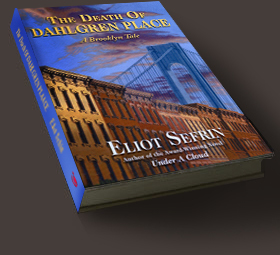 Except for its location—adjacent to the Narrows and at the base of the would-be bridge—Dahlgren Place is a composite of a typical Brooklyn street in a typical middle-class Brooklyn neighborhood in the 1950s. Streets like that were our playground, our sanctuary, a safe and familiar stage for kids growing up in the postwar years. People then were literally defined by the street on which they lived. We knew our street better than any other place on earth. We measured our achievements there, calibrated our maturity, discovered our limitations, forged our first friendships, and sought shelter during setbacks. Nothing was quite the same as being on our street. It was familiar turf. It was safe. It was home. When streets like Dahlgren Place were killed off by public works projects like the Verrazano-Narrows Bridge, a way of life was killed off, too. Q. What was so special about Bay Ridge and similar Brooklyn neighborhoods? A. Everything—and nothing. Bay Ridge, in many ways, typified the postwar, middle-class Brooklyn neighborhood. It was familiar, self-contained, communal, vibrant—something people could identify with, something they could call their own. People walked the streets. They knew their neighbors. Everything they needed—schools, stores, library, post office, bus and subway stops—was accessible. Lives were out there for everyone to see. Even by the late 1950s, when the novel is set, TV had not completely taken over; people hadn’t yet grown afraid of the streets. Windows were open. Doors were unlocked. On summer nights, streets were filled with people escaping the heat, lounging on folding chairs, stoops, fire escapes, porches and rooftops. Bay Ridge, like most of Brooklyn’s neighborhoods, was also manageable. Neighborhoods like that—orderly and self-contained, with their own special look, feel, landmarks and population mix—enable residents to experience city life in a bite-sized way. Within their borders, people could experience the essence of small-town America. They could feel anchored amid the enormous web of neighborhoods that comprised the city’s complex fabric. They could feel secure amid the vast, shifting sea of people that defined the largest city on earth. They could feel, for the most part, in control of their lives. Of course, there was one final thing that made Bay Ridge special: its location. The neighborhood was—and still is—located at the westernmost tip of Brooklyn, along the mile-wide channel known as the Narrows. It was a perfect site for a bridge that would link Brooklyn, finally, with Staten Island; link New York’s five boroughs together for the first time; link the greatest city in America for the first time to the nation’s mainland. Bridge opponents feared the loss of what made the neighborhood special to them. Many residents were fearful that the neighborhood would be dealt a crippling blow by the bridge and expressway to it. People feared being uprooted, severed from their sense of place, and disconnected from everything that was familiar and safe. They resented city officials for their power of eminent domain. They knew that homes and businesses would be destroyed, thousands of people would be forced to relocate, friendships would be lost, property values would plunge, the neighborhood would face unwonted traffic issues, and an entire way of life would be destroyed. Q. What role does the famed Master Builder Robert Moses play in the novel? A. He plays a central role. Moses, who many consider to be the greatest urban planner of all time, was the architect of nearly all the changes transforming New York at the time. During an unprecedented, three-decade-long reign as the city’s top planner, he literally dismantled and remade the city, revitalizing it, modernizing it and creating public works projects and attractions that drew worldwide attention. He also constructed a network of arterial highways and river crossings widely considered the greatest feat of urban construction in history. His transportation template—encompassing hundreds of miles of parkways, expressways, causeways and traffic interchanges, along with dozens of bridges and tunnels—literally redefined New York. Moses’ achievements earned him a status that, for years, was nearly exalted. He was celebrated as an urban hero, possessed of almost mythical qualities. His ideas served as a model for most American cities. And his power grew. Arguably the most powerful public official in New York’s history, Moses occupied no less than a dozen municipal posts simultaneously. As New York’s construction coordinator, he had a free hand over the design, location and purse strings of every public construction project in the city. Moses presided over this empire like an all-powerful ruler, immune from the restrictions imposed on government agencies, free of public or political pressures, deaf to criticism, wielding his authority with a combination of ingenuity, cunning and ferocious intensity. But all this building came at a human price. To build as he did, Moses had to literally carve his way through New York’s infrastructure. Private homes, apartment buildings, and businesses were demolished in droves. Hundreds of thousands of people were uprooted and relocated. Critics argued that Moses was out of control with his obsession to build, putting his projects before people, placing his emphasis on cars rather than pedestrians, and focusing solely on roads instead of a more balanced approach to transportation. Moses’ motives and methods, accepted for decades as gospel, were also being questioned. Critics argued that the famed “Master Builder” was blind and deaf to the opinions of others, callous, arrogant, imperious, masterminding a tidal wave of urban renewal and public works projects that would ultimately ruin the city. Critics like Jane Jacobs felt that the future of New York depended far less on high-rise slabs and superhighways than it did in preserving what made the city great in the first place: Older streets that were full of life; blocks that were serendipitous, spontaneous, organic; neighborhoods with stores and hangouts that were reachable by foot. Q. New York was embroiled in controversy at the time, wasn’t it? A. Isn’t it always? The end of the 1950s was certainly the beginning of a tumultuous era of change, and one in which people were questioning government actions that had traditionally gone unchallenged. Moses was at the center of the controverst. In the case of the bridge, the controversy, in essence, involved a battle to define the direction the city was taking in determining its fate. In many ways, it reflected a tug of war between the highway and the city block, the pedestrian and the car. Advocates argued that the bridge would have immense benefits to New York—tying its boroughs together; stimulating commerce; providing access to the suburbs and bypass routes around the city. New York, they contended, would literally not survive without the roads and bridges being built. Cars had become the lifeblood of the region. Roads and bridges were seen as essential. The age of the Interstates was in full swing. Prominent urban planners also backed the notion of a “Radiant City,” an idea that cities could be cleansed of chaos and clutter—that traditional neighborhoods could be supplanted by pristine, streamlined cities with endless rows of concrete-and-glass towers, all linked by expressways. Critics argued that projects like the Narrows bridge and expressway through Bay Ridge were destroying traditional neighborhoods, uprooting tens of thousands of people needlessly, eradicating precious landmarks, and literally chewing up the city. They contended that the roads were isolating and quarantining people, amputating them from their roots, dividing cities by income and race, sucking the life from downtowns. Q. The sweeping changes taking place in New York and Brooklyn were characteristic of changes throughout much of the country. Isn’t that right? A. That’s very true. The building of the bridge and expressway took place at a time when America was carving up its countryside with roads and major public works projects, entering a modern new era whose arrival had been delayed by the Great Depression and World War II. America’s new Interstate Highway System, advocates were saying, was a social triumph unmatched in America’s history. It represented not only technological achievement, but became a mainstay of commerce and changed our national landscape in a way that reflected new patterns of life. The roads and bridges America was building back then enabled people, for the first time really, to escape the shadows of their offices and factories, live and work wherever they wanted, enjoy a mobility that previous generations had only dreamt about. They also symbolized America’s fascination for the open road, reflected a nation celebrating its mobility and freedom, a people attempting to conquer the distances that separated them. Of course, there was a lot more at work than simply that—specifically a powerful highway/auto lobby that pushed for roads and large-scale public works projects. Billions of dollars were at stake for special interests when it came to projects like the Verrazano-Narrows Bridge. But, regardless of the reasons for the building, the reality is that America in the midst of an era of dispossession unlike anything seen since the days of the Wild West. Eminent domain was an everyday fact of life. Highways were killing small towns. Urban renewal was eviscerating hundreds of so-called “blighted” neighborhoods. Businesses were being closed, private property seized, families separated, social bonds destroyed. Tens of thousands of people were being uprooted and dispossessed, stripped of their sense of place, their quality of life. In New York alone, half a million people were displaced by expressways being rammed through the city, many through traditional, established neighborhoods like Bay Ridge. Q. Exactly how was Brooklyn changing? A. It was changing in many ways. For decades, Brooklyn had been one of America’s great manufacturing powerhouses and maritime centers. But, by the late 1950s, time had caught up with the borough. Its industrial base was fragmenting. Companies were relocating to the suburbs and other states. Retail anchors, landmark restaurants, breweries and businesses that had been part of Brooklyn for decades were abandoning the city. Brooklyn’s waterfront—once the symbol of the borough’s booming economy and industrial might—virtually collapsed. In truth, what was happening to Brooklyn was happening to much of urban America. New York was in the midst of a metamorphosis, being transformed from an industrial powerhouse to a consumer’s market. Manufacturing and distribution firms were being replaced by service industries—banking, insurance, real estate, health care and similar businesses. And all of it was happening fast. Established neighborhoods were being bulldozed. Highway construction and slum clearance were displacing thousands of people. Landmark structures were being razed. For many people, it seemed as if the familiar texture of everyday life was disappearing literally overnight. All this had a profound impact on many people in Brooklyn—especially those rooted in the borough for years. The loss of the Dodgers had already left a tremendous lasting scar. But now familiar totems, ingrained for decades as part of the Brooklyn’s unique personality, were disappearing, too. Ebbets Field was being demolished. The Navy Yard was decommissioned. Coney Island was in a decline. The movie theaters along Flatbush Avenue were being padlocked. Many of Brooklyn’s most venerable downtown landmarks were being erased. And the biggest change of all? Legions of minorities were flocking to Brooklyn—and the white middle-class, fearful, pessimistic over the city’s fate, was fleeing for the suburbs. People couldn’t wait to get out of the city, to abandon everything they once professed to love. The highways around the city made this possible. Projects like the bridge changed the contours and composition of the city forever. Q. The novel’s protagonist, Nathan Wolf, is conflicted by all of this. How so? A. Nathan struggles to see beyond the tempest on the streets, beyond the chaos and the heartache, the confusion, dislocation and shattered fragments of his former way of life. He tries to view things with an open mind, with a distinct upside, as part of an inevitable process of progress and change that continually reshapes great cities like New York. He’s certainly conflicted, however. The bridge inspires him, sets him on an exciting, eye-opening journey of self-discovery. Yet he’s ashamed he sees it as anything other than a symbol of unwelcome disruption, uncertainty, fear, emptiness, and loss. He’s ashamed he often feels uplifted and inspired about something that makes so many people—including his own family—angry, frustrated, and bitter. He tries hard to reconcile these conflicting feelings, but is often left with more questions, uncertainty, confusion, and doubt. Ultimately, Nathan and his family—uprooted from their close-knit, beloved neighborhood by the building of New York’s last great bridge—experience the sense of dislocation, confusion, and loss that many people felt. But Nathan also discovers some unexpected miracles in the process. Q. Ultimately, was the bridge good or bad for the people of New York? A. I intentionally try not to place a judgment on that. Certainly there were benefits to the bridge and the progress it represented. However, I do think we’re poorer in a way for what we lost with the construction of projects like this: Neighborhoods that were close-knit and intimate, where people could walk, meet people they knew, feel safe, anchored and connected; neighborhoods that were easy to navigate; with a sense of closeness and coherence; with easy to access resources like stores, schools, parks, intimacy, not as dependent on car. Many people I’ve met who grew up in Brooklyn lament what was lost in the transformation of the borough; they lament that their children missed something by not growing up in places like that. We’re actually seeing a move by planners to what they’re calling a “new urbanism”—a return to those kind of traditional neighborhoods and values. Q. Despite many people’s fears, both Bay Ridge and Brooklyn managed to survive, didn’t they? A. They certainly did. The bridge and expressway may have may have reshaped Bay Ridge, altered thousands of lives and changed New York forever. It may have signaled an unwelcome, premature end to everything familiar and comforting, to an entire way of life, to innocence and childhood itself, as it did for Nathan Wolf. But Bay Ridge went on. And so did Brooklyn. It’s a very different Brooklyn than the one we grew up in, of course. But that’s nothing new, nothing unexpected. Brooklyn’s story has always been one of settlement, development, resettlement and change. The change has often wrought havoc. But it’s part of a natural cycle. The world’s great cities are constantly remaking themselves, redefining what they are, tearing themselves down and rebuilding themselves. Places like Brooklyn have thrived, then withered, then been revived. But it also brings rebirth. It was no different then in New York. The city was changing to accommodate the car, the same way it changed once to accommodate subways and trolleys and buses. People changed. Neighborhoods changed. Old landmarks were replaced by newer ones. New generations of children are growing up playing on the streets, engaged in the rituals of family, school religion, life. There might even be an era of renaissance, a time when Brooklyn would come full circle, rise from the ashes. Brooklyn evolved further after many of us left. The floodtide of decline slowed. People returned. Money began flowing in. New businesses took hold. Abandoned factories and warehouses were transformed into apartments and studios. Historic structures were restored. Entire neighborhoods, once given up for dead, are being reborn. In many ways, a new Brooklyn has risen on the foundation of the old. Yet, with all this change, Brooklyn remains what it always has been: vibrant; bustling; diverse; a magnet; an entry point into America; a staging area where people could learn to assimilate, leave to live in a city, learn to become Americans. It’s still what it was back then: a great bubbling cauldron of people engaged in the endless cycle of arriving, assimilating, co-existing, working, playing, celebrating, mourning, praying, dreaming, building, rising, departing. It still survives—moving on like the rest of us; continuing on its evolutionary path; part of a never-ending continuum. Q. What message are you trying to communicate with your novel, Under A Cloud? A. Aside from telling a powerful and dramatic personal story, Under A Cloud examines issues that I think are timely and important. They’re timely because the kind of incident depicted in the book – a fatal shooting involving white police officers and a minority youth in a poverty-stricken community – continues periodically to create headlines and heated controversy. I think it’s important that we learn from these incidents in a way that can help us live together and build stronger communities. 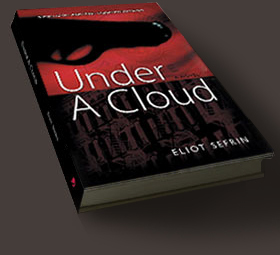 Under A Cloud tries to shed light on the devastating impact that even an accidental police shooting can have on communities, cities, and the lives of both the officers and the families of victims. It’s the story of how a single, instantaneous, life-and-death decision by an officer – under the most difficult and harrowing of circumstances – can have tragic and potentially explosive consequences, given the volatile chemistry of race relations in many cities. Aside from addressing a multitude of police-related issues, I think the novel provides us with a glimpse of who we are as a people . . . and who we’re capable of being. In the context of the tragic shooting that takes place in the book, readers, I think, are exposed to emotions that can blind us to the truth, stereotypes and abstractions that can divide us, and actions that can haunt, and ultimately diminish us, as people. Similarly, through the novel, we witness actions and emotions that are capable of lifting us above stereotypes and hysteria and mistrust and history – actions that bind us, and enable us to recover and heal. More than anything, I hope readers take that final message away from the book. Q. How often does the kind of controversial police shooting depicted in your novel actually occur? Can these kinds of incidents be avoided? How should we react? A. Even though they receive intense media coverage, police shootings are actually rare. In fact, something like less than 1% of encounters between police and civilians involve the use of force. I think, by and large, police do a commendable job in exercising restraint. For every violent officer out on patrol, there are thousands who do everything they can to avoid the use of force. Most, in fact, never fire their gun throughout their entire career. All are well aware of the serious legal and emotional repercussions of line-of-duty shootings, particularly controversial cases that involve alleged civil rights violations or alleged police brutality. Despite this, police do kill several hundred people a year in the line of duty. For the most part, the shootings are ruled as justifiable. But more than a few over the years have involved questionable acts that violate either departmental policy or the law. Experts say there are several ways these killings can be minimized: by expanding the use of less-lethal weapons; through better training, a toughening of firearms policies and a weeding out of officers who are violence-prone. But, in truth, police decision-making in a lot of these incidents is a complex calculus. Often, the shootings take place in high-crime neighborhoods. The officers are emotionally charged. Lighting conditions are poor. Identities are blurred. Intent is ambiguous. Actions are misinterpreted. Commands are ignored. It’s hard for even the most experienced officers to distinguish reality from perception. Often, the officer finds himself in an ambiguous, nightmarish, no-man’s land, with gut-wrenching, split-second, life-and-death decisions to make…or simply to react on instinct. And sometimes, yes, decisions are colored by racial stereotypes and abstractions and history. In that sense, incidents like the kind depicted in Under A Cloud are probably an inevitable and tragic byproduct of a difficult job. It’s impossible to eliminate confrontations between officers and civilians in dark locations. It’s impossible to eliminate fear and confusion and racial stereotypes and references to past cases where officers either killed wrongly, or were killed themselves because they hesitated to shoot. The more important questions are: how should we react to these incidents, and what should we learn from them? How do we avoid instantly labeling them based on blind assumptions colored by race? How do we prevent history and hysteria and a rush to judgment from blinding us to the truth? How do we investigate them swiftly and impartially and judiciously, and with fairness to all sides? How do we avoid overlaying an injustice on top of a tragedy through politically motivated knee-jerk acts of discipline? Most importantly, how do we, as a society, eliminate the conditions and the mindset that result in the kind of explosive racial confrontation depicted in the novel? I think we need to react by asking all those questions, and assuring that the answers are satisfactory. Q. Are the police and the community able to co-exist peacefully in poor, minority neighborhoods? Why or why not? Have race relations improved over the years between these two groups? A. By and large they do manage to co-exist peacefully day to day, even if it’s often an uneasy and fragile peace. – in this case the accidental shooting of an innocent black teen by two white police officers – could instantly become the flashpoint for an expression of deeply-rooted grievances and emotions among both blacks and whites. We’re exposed in the novel to a raw and ugly racial tension that exists just beneath a surface of calm in a poverty-stricken, minority neighborhood. We see how this tension is a product of years of bitter confrontation, mutual hatred, mistrust, anger, fear, racial stereotypes. We see how it’s fueled by a long-held belief on the part of many community residents – justified or not – that the police are oppressors moreso than adversaries . . . that they’ve been engaged in a pattern of racially motivated, brutal and unjustified acts: A reckless and indiscriminate use of firearms. Harassment, racial profiling and other civil rights violations. Coverups into acts of wrongdoing. The police, of course, feel far differently. They see themselves, not the community, as the oppressed, the targets of racism, unappreciated, scorned, maligned, under siege, unfair victims of history. It’s a highly volatile chemistry – and, sadly, it exists in many places, even if it’s shrouded by a sense of calm. In that sense, I think the question shouldn’t really be whether the police and the community can co-exist in these kinds of neighborhoods – the question should be what causes such potentially explosive tension, in what communities does it still exist, and how can we eliminate it so we can truly live together peacefully? Under A Cloud is set during an especially tumultuous, politically charged time in New York, when racial tension was running especially high. I think conditions have improved since then, thanks to a lot of factors: Advances in civil rights, and fundamental changes in the way police deal with minorities. A more enlightened approach by law enforcement. Community vigilance. The impact of community outreach programs. A younger, better educated, more diverse and culturally-aware police force. We’ve also learned, I like to think, from history and past cases. Clearly, though, I think the most progress has been made in those communities where both sides work hardest at a true peace; where both sides have made an effort to heal old wounds, and keep them from being re-opened; where both sides try to lift themselves above the emotions that divide us and focus on the actions that can bring us together. Q. In your novel, a protest leader is quoted as saying, “violence is the language of the unheard.” Could you elaborate on that statement? A. That’s a quote in the story that’s attributed to Dr. Martin Luther King, although I’m not really sure of its source. It refers to the belief that people who riot as a form of social protest are generally at the very bottom of the nation’s social scale, and that their violence is not merely a reflexive act of lawlessness, but a product of intolerable living conditions that breed resentment and desperation and frustration and rage . . . symptoms of a greater illness. It’s far more complex than that, of course, but in the novel the protest leader states that people are looting and destroying the very neighborhood they live in because they feel they have no other recourse, that it’s the only way they feel they can be heard. Many feel that, for years, they’ve been victimized by a pattern of racially motivated, brutal and unjustified acts and civil rights violations on the part of police . . . that they’re, in effect, being terrorized by the very people paid to protect them. They charge, further, that previous protests about similar police shootings have gone ignored, that investigations into allegations of police misconduct have been biased and whitewashed, and that the community has been ignored by city officials, and allowed to rot. The way they express themselves – through looting, rioting and other acts of violence and lawlessness – is not a form of expression that most people condone, even many within the community portrayed in the novel. But it’s a way some protestors react in the immediate aftermath of the shooting depicted in the book, before the protests take the form of more organized and peaceful demonstrations. Q. There has been an outcry by many minority groups and police organizations over alleged flaws in investigations involving police shootings. Do those protests ring true? What, if anything, can be done to correct the flaws? A. Yes, I do think there are flaws – from several perspectives. For one thing, the sheer length of time these investigations take – generally months and sometimes years – can be grossly unfair to the families of victims, the officers involved, and the public, which is seeking answers. Only last year, in fact, the Los Angeles Police Commission approved measures to cut months off the time it takes to investigate line-of-duty shootings. Other cities will probably follow suit – and that clearly needs to happen, for everyone’s sake. From the perspective of police advocacy groups, the way shooting cases are handled can be grossly unfair to officers, who are often demonized and unjustly pre-judged as guilty in the court of public opinion – simply by accusation – well before the outcome of investigations and possible trials. At its worst, the process of investigating a police shooting can essentially rob a cop of the Constitutional guarantee of due process. Officers accused of misconduct are not entitled to the same presumption of innocence that any other citizen enjoys when charged with a crime. Their job, in effect, takes priority over their rights as a citizen. In most cases, they’re either automatically suspended from the job, stripped of their firearm, or assigned to modified duty, pending the outcome of the investigations. They also often face multiple investigations -- departmental, criminal and civil rights probes, for example – each with differing burdens of proof . . . in effect, double and triple jeopardy. Whether they’re found guilty or not, they’re forced to go through an emotional hell, while living under a cloud of suspicion, criticism, personal threats and legal uncertainty. Careers have been unjustly destroyed. Families, reputations and personal lives have been shattered. Moreover, these cases generally become highly political, as various factions vie for public support and control of the police, engage in race-baiting or anti-police bias, or attempt to advance a political agenda. Innocent officers with long-held perfect records and impeccable reputations have been made a political scapegoat as a tradeoff for neighborhood peace. Racial considerations have been given more weight than the truth. Decent, competent unbiased cops have been unfairly maligned. The message here is that if we’re to truly be just, we can’t afford to succumb to a rush to judgment dictated by controversy or political pressure – just like we can’t afford to turn a deaf ear to charges about cases of police cover-ups, tainted or stonewalled investigations and a lack of accountability. We can’t have either no discipline for officers if they’re found to be wrong, or automatic discipline before the facts are in. I think we also need to understand the factors involved in shooting incidents like this, not only so we can avoid them, if possible – but so we can learn to react to them on a case-by-case basis, free of hysteria and knee-jerk reactions driven by false and biased assumptions, in an unbiased attempt to uncover the truth and react accordingly. Q. Many police officers and other first-responders have experienced, or been diagnosed with, Post Traumatic Stress Disorder. What is PSTD, and what services are needed to help officers and their families deal with the job’s intense emotional demands? A. PTSD is an intense emotional reaction to situations that are emotionally overwhelming – in effect, a profound wound to the psyche that can as debilitating as a physical wound, and far more lasting and unpredictable. It affects legions of police officers, firefighters, medical personnel, soldiers, emergency workers and other first-responders. In Under A Cloud, I wanted to illustrate the full range of the devastating effects of PTSD by telling the story through the eyes of two police officers involved in an accidental and controversial line-of-duty shooting involving an innocent child. Shooting a child is extremely traumatic for cops, and often produces serious, complicated, unpredictable, long-term effects that can crumble family relationships, and lead to acute physical symptoms and a wide range of psychological disorders and addictions, even suicide. In Matt Holland’s case, he suffers from guilt, remorse, disbelief, despair and self-pity. His entire belief system is shaken to the core, and his most basic assumptions are tested. He withdraws almost entirely, and finds himself a prisoner to feelings he’s unable to express and afraid to share – an imprisonment common in a police culture that shuns displays of emotion and efforts at help. Holland’s family also becomes secondary victims of the tragedy, as Katie Holland, the officer’s wife, attempts to hold their family together, even as she copes with her own frustrations and fears. Similarly, Rachel Cook experiences a wide range of symptoms of PTSD – including flashbacks, panic attacks, depression, night terrors, betrayal, paranoia, shock, frustration, numbness, disillusionment and apathy. Like Holland, she withdraws, starts to see the whole world differently, finds it difficult functioning, loses interest in things she loves. I think it’s important for police departments and the public to be aware of not just the impact of PTSD, but the unrelenting, accumulated stress of police work … how the emotional machinery of so many officers is tested and compromised, or breaks down . . . how the job impacts and changes people . . . how most officers have no means for dealing with the job’s emotional demands. Police departments – if they’re not already – should equip themselves to assist their people with psychological support services. At the time Under A Cloud is set that was far from the case. There was no safety net for cops who suffered trauma: No debriefing, no counseling, no peer support, no critical-incident stress intervention. In many ways, in fact, the department made things even worse by the way they handled things, inflicting, in many ways, a ‘second wound’ on the officer. I think a lot has changed and departments are more enlightened now. But the key is that officers and others suffering from PTSD need to rise above the prevailing notion that admitting to their problems and seeking help is a sign of weakness. They need to break free of the “tough guy” role and recognize that they’re human. They need to value their feelings as much as they value their toughness, bravery and street smarts. They need to understand that their psyche is not bulletproof, and that getting help is really a sign of strength, not weakness. They need to recognize the value of seeking support from family, friends and peers . . . and understand that there’s no magic cures when it comes to healing from extreme trauma – only patience, persistence and hard work. Q. An important theme in Under A Cloud is that of recovery and healing. How do you think people are able to carry on once they’ve been scarred by a nightmarish tragedy like the one depicted in the novel? A. I think the capacity of human beings to heal from even the most traumatic of occurrences – or at least to recover well enough to carry on with their life – is remarkable, if not miraculous. Which isn’t to say, of course, that many people don’t recover, or that they don’t carry scars around with them all their life. But others find themselves lucky enough, or insightful enough, or courageous enough, or strong enough, to heal – by reaching out to others, by looking inside themselves, for love courage, communication, understanding, wisdom, a sense of closure. Ultimately, I think it’s other people who can help pull us through trauma and tragedy. An important message I try to convey in Under A Cloud is that people – by seeking help, admitting to their feelings, reaching out to others, finding the things that give their life meaning and balance – can put trauma in perspective, learn from it, make it part of the past instead of a daily torment. By the end of the novel each of the book’s major characters – either through love of family, religion or peer support – manages, after a prolonged ordeal, to somehow find a way to put the tragic incident behind them, and find a way to carry on. Even the city, the NYPD and the neighborhood – so ravaged by the event -- are on the path to recovery. I want readers to be left with the feeling, as tragic as the story was, that there’s a reason for hope . . . that things were learned . . . that improvements were made, that people managed to find a way to move forward. I hope that’s what readers feel. I hope they see that Under A Cloud is, ultimately, a story about healing and recovery; about the resiliency of the human spirit; about the notion that we can all discover a way to carry on. Q. What are the unique challenges faced by women in law enforcement – and, in your view, can women handle the physical and emotional demands of police work? A. The greatest challenge, of course, has always simply being accepted as equals in a male-dominated profession. While most male cops have accepted the ideas of females on patrol, however reluctantly in some cases, there are still reports of outright rejection, sexual harassment, hostility. It was also an issue, as much as anything, of image. The traditional image of the cop had always been, by definition, unwomanlike. Cops’ reputations were built on toughness. They were strong, rugged, physical, aggressive, stern, unemotional, courageous, patriarchal. Women, in contrast, were seen as the very antithesis of that: they were weak, passive, sensitive, emotional, lenient, motherly. In short, they were everything a good cop wasn’t. Most men, in fact, believed that in order for a woman to be effective she’d have to achieve what amounted, in essence, to a reversal of cultural roles. And that, they reasoned, was virtually impossible. They also saw the presence of women as an unwanted invasion of their very precious all-male turf, and in some ways as a threat to their masculinity. Women, in some ways, symbolized the end of the job as they knew it. And in some ways they were not only afraid that women couldn’t do the job, perhaps they were afraid that they could. Some women succumbed to the scrutiny and status inferiority by overcompensating and becoming overly aggressive … watching as others became paralyzed with fear over making a mistake . . . watching as still others refused to call for backup when they truly needed it, for fear they’d be ridiculed . . . battling to dispel stereotypes and myths. The other challenge they’ve faced is that, certainly in the beginning, there was no margin for error. Women were being studied, evaluated and judged like no cops before or since. Critics were pouncing on their mistakes as proof they couldn’t do the job. There were rumors of female cops who allegedly froze during confrontations, rumors of others who allegedly panicked or acted irrationally in the face of trouble. There were stories of female cops who supposedly locked themselves in patrol cars when things turned ugly, who summoned backup on routine calls, who remained in patrol cars until their male partners chivalrously opened their door. Since then, we’ve seen women perform competently, even heroically on the job – making arrests, taking risks, making sacrifices. We’ve seen female officers bring an important new dimension to police work, acting as deterrents to violence, providing a calming influence, and assisting with crime victims. By and large they’ve been judged as possessing patrol styles and activity levels practically indistinguishable from the men’s. in many cases, they are also judged as being more articulate, more intelligent, more creative, less violence-prone, easier to supervise, more respectful, and possessed of better work habits. So, I think the answer is that yes, they can certainly do the job. Just like men, they should be judged on an individual basis. And, just like men, they should be given a chance, absent of bias and harassment. Q. Your novel is set in the Brownsville section of Brooklyn in 1973? Is there any reason for setting the story in that time and place, and is the novel relevant to today? A. I think Under A Cloud is relevant to today because it examines issues that are not only timely, but because the kind of incident depicted in the book continues to create the kind of headlines and controversy depicted in the novel. The shooting depicted in Under A Cloud, in fact, could have happened today – or it could happen tomorrow. It was set in 1973, however, for a specific reason. The ’70s were a tumultuous time in which inner-city neighborhoods were being transformed by important social changes, and rocked by new forms of activism. It was a period of transition between the old way and the new, where issues raised by the tumult of the ’60s were being addressed in terms of public policy. It was also a period in which the political atmosphere of New York was particularly electric – even toxic – and law enforcement was under a unique form of siege. A virulent anti-police backlash, borne in the ’60s, was sweeping the country. Police were under scrutiny as never before. Their efficiency and procedures were challenged. They were losing their status in the courtroom. Their credibility had bottomed out. For the first time ever, they were being hauled into court for actions they’d always assumed were routine. Pressure for reform was intense. Political capital could be attained by attacking them. And police departments across the country were subject to massive, often gut-wrenching, forms of reinvention, including the controversial advent of women on street patrol – a move that was receiving much attention and generating a great deal of controversy. The timing of the shooting incident depicted in the book is critical to the direction of the plot, because this was a time that was especially ripe for an incident like this to unfold. It was, in many ways a “perfect storm” of conditions that were present. In reading the book, I hope that readers are not taken back in time, as much as simply forgetting about it. I hope they feel the story could easily have happened this year. Regarding Brownsville, I also wanted to paint a portrait – as best I could as a middle-class white writer – of a poverty-stricken, troubled inner-city neighborhood. The Brownsville section of Brooklyn, where the story is set, was once one of New York’s most vibrant neighborhoods. Once predominantly white and Jewish, it had been reshaped by complex forces that had led to a physical, social and ethnic metamorphosis. An ugly, barren ruin at the time of the story, it’s a metaphor for the decaying inner city. Referred to in the press as “Bombsville,” it was symbolic of the nation’s urban problems at the time: poverty, crime, unemployment, drugs, homelessness, despair. I wanted readers to see it, feel it, understand how it had been transformed, and how it affected the lives the people who lived there. The related issues of poverty, despair and frustration – the notion that people destroy impoverished neighborhoods because they’re breeding grounds for resentment, desperation and rage – I think, are tied closely to much of what unfolds in the novel.